Close your eyes and imagine drawing a big circle. • Inside the circle write the number 100 very carefully. The number must touch the edge of the circle just barely and can’t go outside the circle. 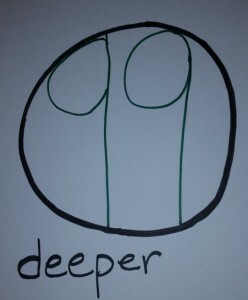 • Then write the word “deeper” outside of the circle. • Now erase the number very carefully, as if your eyes were an eraser. Be careful not to erase any part of the circle, just the number itself. P.S. I’ve never made it to the 80’s!